Is there special event coming up? Celebration, birthday or even Christmas and you want to buy something different? 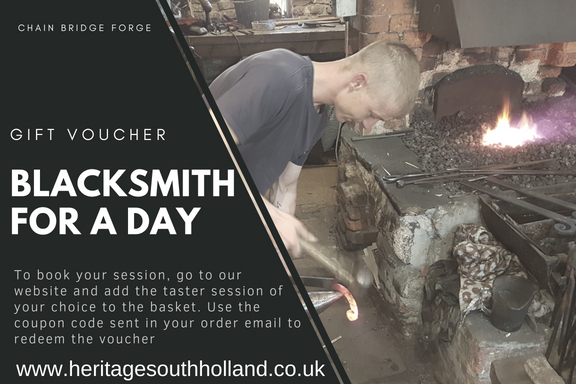 Look no further for that special gift and purchase a voucher for a Blacksmithing Taster Session at Chain Bridge Forge. Worth £120 for a full day session or £60 for half a day, the voucher entitles the bearer to a one-to-one session with Chain Bridge’s resident blacksmith, learning about this ancient skill and creating their own “forged” item, such as a coat hook, to take away with them. Taster days are held on Saturdays throughout the year. Spaces are limited. To book online, add the taster session of your choice to your basket and use the coupon code sent to you when you ordered your gift voucher.